All selections published by Twin Grands Publishing Co. WHEN Art Ferrante & Lou Teicher received a phone call early in 1950 from National Concerts and Artists Corp., booking them for 233 concerts, little did they know they were about to become the two busiest pianists in the entertainment world! Ferrante & Teicher literally dropped everything they were doing to prepare for what would become a 40-year whirlwind career. An analysis of the history of those four decades reveals 4,500 concerts, 5 record labels (that produced 190 F & T albums) and dozens of television and radio appearances, totally consuming their careers until their retirement in 1989. Eleven years later, in 2000, I discovered an old 7” unlabeled reel-to-reel tape. Fascinated by the tape’s weird piano sounds, I sent copies to Ferrante & Teicher. Both Art & Lou were stunned upon hearing the tape! It was the recording they made of their ‘gimmicked’ twin-pianos, during their Juilliard School of Music days! They recalled ‘having a ball’ inserting rubber mutes, paper wads, chains and strips of wood or glass across the strings — plucking, strumming the strings, etc. What they had just heard was that forgotten 18-minute tape of their first-ever recording! And so, filled with memories, they decided to recapture that sound. Out of retirement they came, and back into the studio they went! Seven days later they had applied 18 more minutes to the original tape. Searching for a title, they decided that each weird sound represented a class of aquatic occupant; hence the title — DENIZENS of the DEEP! WHAT do you get when you cross two Juilliard-seasoned child prodigies bearing tricked-up Baldwin Grands with a passel of Broadway chestnuts, ballads and breakneck showstoppers? Simple, really. You get nothing less than a legacy of the most insistently creative, enjoyable, challenging and virtuosic arrangements ever pointed at the mid-twentieth century pop repertoire. …flashback to Juilliard School of Music, circa 1946. While searching for a rhythmic accent to their twin-piano arrangement of Ravel’s Bolero. Art and Lou became intrigued with the experimental techniques of manipulated and altering the sound of the piano by means of specially-constructed hammers, the insertion of found objects between the strings, and bare-handed strumming and plucking of the soundboard. These methods lent an almost limitless tonal and percussive range to the keyboard. The sound palette grew and grew, and the duo were off and running. It didn’t take long before those unearthly sounds emanating from the piano strings began to be employed to delightful effect on the popular music the two graduates loved. By the early 1950s, the ‘Grand Twins of the Twin Grands’ were the toast of the talk-show circuit with their dramatic, camera-friendly (if decidedly offbeat) performances. Their hellfire tempos, dazzling arrangements and string-bending calisthenics deep within their Baldwins had established the pair as swashbuckling piano showmen. In the end, perhaps it was the sheer novelty of their prepared-piano approach that limited their audience. It has taken close to half a century for us to apprehend fully what these ingenious musicians were actually up to. And now, as the millennium line has been crossed, ears all over (and many very young ears indeed) are catching the utterly unique soundscapes of those early days of Ferrante & Teicher’s career. The recording you hold in your hands is an important one for many reasons: it marks not only the first recorded work by Ferrante & Teicher, and the only completely self-penned album the duo has ever released, but it also gives a fascinating peek into the evolution of their newfound technique. 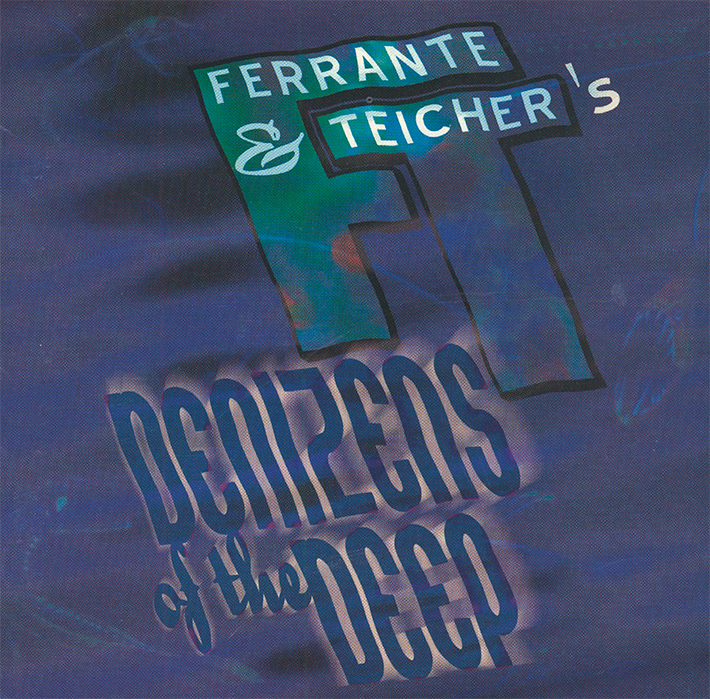 Denizens of the Deep captures Art and Lou at their crucial point in time, as they applied new techniques of their classical training… with eyes and ears as wide open as their pianos, discovering a new world of sounds within their cherished instruments. The melodies undulate like ocean waves, sailing a lovely and balanced line between the classical, popular and experimental traditions. It predates their earliest published works by several years. And upon hearing the newly discovered master tape afresh after so many years, Art & Lou were moved to unpack their ‘tools’ and embellish the compositions with their seasoned 21st-century perspective. This fifty-year bridge spanning their colorful career lends even more eloquence and import to the occasion of this release. Viva la Ferrante & Teicher!